Shared sacrifice? I’ll think about that the next time I’m forking over a check for $8,000 in income taxes, while the person in front of me is walking out with an $8,000 refund check. Nobody is willing to pitch in any further to help out an irresponsible bunch of crooks in Washington D.C. The truth is that 53% of us have already been pitching in, while 47% of Americans have not been paying any income taxes at all. It’s the 47% who don’t pay income taxes, the ones reaping all the misconstrued benefits, who need to pitch in. 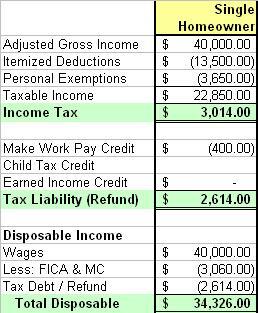 According to the Tax Policy Center, in tax year 2009 there were 151,500,000 tax filers excluding dependents of other taxpayers and out of those 71,000,000 (46.9%) had a zero or negative income tax liability. Those are the ones who need to start sharing and sacrificing. “But how”, you say? “There’s nothing to cut”. There’s always room for cutting waste, fraud, and abuse. For starters we can get rid of the following tax credits: Make Work Pay Credit, Economic Recovery Credit, Earned Income Tax Credit, Child Tax Credit, Hire Credit, and American Opportunity Credit. (And while we’re on the topic, no one asked for the first time home buyers credit, or cash for clunkers, so don’t get any new bright ideas.) No one really asked for any of this crap in the first place, it was all crammed down our throats by politicians thinking that they were helping us out by throwing away a little money that they didn’t have to begin with. And now they want us to pay more to cover their … tab? How irresponsible can you get? And what’s sick about it is that their real motivation was vote buying (probably with criminal intent). My parents never got a child tax credit or an earned income tax credit. Neither did I. This stuff wasn’t around in the 60’s and 70’s, and though the EITC was around in my day, we always made too much to qualify. I always looked at these credits as a form of welfare anyway, and I have never taken welfare or food stamps. I slept in a homeless shelter for a week one time, but I never asked for anything from the government. I was on unemployment for two weeks one time, when I was laid-off by the federal government, and then quickly recalled, but I didn’t ask for a government handout. What I have asked for, and will continue to, is for the federal government to get its hand out of my pocket, to stop wasting my money, and to lower my tax rate. All I want is more of my own money, not someone else’s. Politicians are quick to judge a private party’s income statement while ignoring their own. What they don’t realize is that there’s such a thing as a balance sheet. According to the government, corporate profits are up, and according to them ‘the bastards aren’t spending’. And so if they don’t spend, political crooks say, “We’ll take it, and spend it for them”. How unconstitutional of you. However, there are two forms of expenditures not included on an income statement of which financial illiterates have no knowledge. Corporate profits on an income statement don’t reflect the amount of money spent on principal repayments of debt, nor dividend payments, as these are not deductible as expenses. Politicians have no idea what obligations a private party may have. They treat individuals in the same manner. For example, the federal government has no idea how much debt an individual has, or whether they have other obligations, such as child support payments. Let’s consider the issue of child support. When it comes to income taxes, there is no deduction for child support payments, and income from child support is not taxable to the recipient. Let’s consider a single mother of three who receives $12,000 per year in child support, and makes a salary of $20,000, and let’s compare her to the father of the children who also makes a salary of $20,000. According to the government it’s the mother who needs taxpayer assistance, but in reality it’s the poor dad who has to work full-time and sleep in a tent. 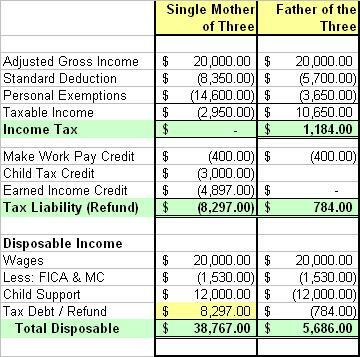 The mom gets a tax refund of $8,297 while dad has to pay $784. The mom has disposable income of $38,767, $8,297 of which was stolen from other taxpayers and handed to her by the government, and $12,000 of which was contributed by the dad. Meanwhile the father is left with disposable income of just $5,686. Yeah, that’s right $5,686. But, according to the government, the mom needs more help, while dad can pay a little more in taxes. Although the example is a bit simplistic, it is someone’s reality; and some degree of this reality occurs at all income levels. Been there, done that. The mom will probably cast her vote for the politicians filling her pockets with goodies, while the dad probably hates all politicians and doesn’t vote at all. The question is: Why is an extra $8,297 tax burden being put on other taxpayers to take care of this mother and her children? When the father gets a raise won’t the mom get one too, since child support is based on a percentage of gross income? Yeah, that’s how it works. So government should just stay the hell out of it, since it isn’t even assisting the right party. Now let’s consider a single homeowner, who has wages of $40,000 and pays $13,500 per year in mortgage interest and property taxes. This taxpayer bought the home for $200,000 and now it’s only worth $150,000 so he’s upside down. He has a total tax liability of $2,614 and is left with disposable income of $34,326. In effect, his tax debt of $2,614 has been transferred to the single mom above, who now has more disposable income than him, even though he makes twice as much money ($38,767 vs. $34,326). But when you ask politicians, they will again say that the single mom needs more help while the single homeowner can afford to sacrifice a little more, never mind his upside down mortgage. Now politicians want to shake more money out of the 53.1% of working people who actually pay income taxes, to support spending for which they receive absolutely no benefit. Most of this excess spending isn’t even getting to the folks who really need the help anyway, such as the unemployed. To top that off, most of it isn’t even constitutional. By what authority does the government take money from one citizen and transfer it to another? On behalf of the 53% who pay income taxes, the answer to your request for more sacrifice is ‘hell no’, ‘request denied’. It’s time for those who are not pitching in at all to give up something. It’s time to cut the fat. It’s time to end the nanny-state. The era of big government is over. If the 71,000,000 Americans who currently don’t pay any income taxes were to pitch in just $1,000 each, the government could raise $71 billion per year, or as the CBO would say, “$710 billion over 10 years”. Yes it’s time for some shared sacrifice, and it’s time to end the free lunch. Get rid of the phony tax credits, extend the current tax rates, and look into the proposal entitled, Revitalizing the U.S. Economy through Unemployment Reform. Put that in your veto pipe and smoke it. That faraway noise you can't identify is me cheering and clapping in S. Florida. You didn't hit the nail with a hammer……..it's a nail gun!